What Do You Like to Do on the River? What do you like to do on the Missouri River? This question as well as many others was asked in the Missouri River Public Use Assessment in 2004 and 2005. During a thirteen month period, a 811 mile area was surveyed about recreational use. The area extended from the mouth of the Missouri River to Gavin Point Dam in Yankton, South Dakota. During the assessment over 2.5 million visitors were surveyed. The results showed that visitors to the park engaged in 72 different activities. These activities include everything from mushroom hunting to flying model airplanes. The top three uses were sightseeing, fishing, and boating. 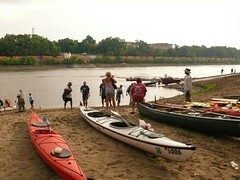 The report also discovered that the economic value of the river to visitors was ranged from 20 to 38 million dollars. Rochelle Renken, the Resource Science Field Chief of the Missouri Dept. of Conservation took part in the assessment and presented information from the findings. The three goals in the survey were to estimate the amount and types of use, describe the users, and estimate the economic value of the river to users. Missouri River Public Use Assessment – a Mo. Dept. of Conservation publication evaluating public use of the Missouri River. is hosted by these wonderful partners. Special thanks to Les Bourgeois Vineyards for giving us the opportunity to use their beautiful space overlooking the Missouri River. All speakers are presenting for free! Thank you all for sharing your knowledge with us! Click here for a list of upcoming presentations» The Big Muddy Speaker Series also takes place monthly in Kansas City and St. Charles. The Big Muddy Speaker Series is partially funded by the Columbia Ecological Services Field Office (USFWS) and the Mo. Dept. of Conservation.